NEW 7-30 GOLD LOAD OF THE NORTHERN PACIFIC RAILROAD CO. SECURED BY FIRST MORTGAGE ON RAILROAD AND LAND GRANT. SAFE! PROFITABLE! PERMANENT! 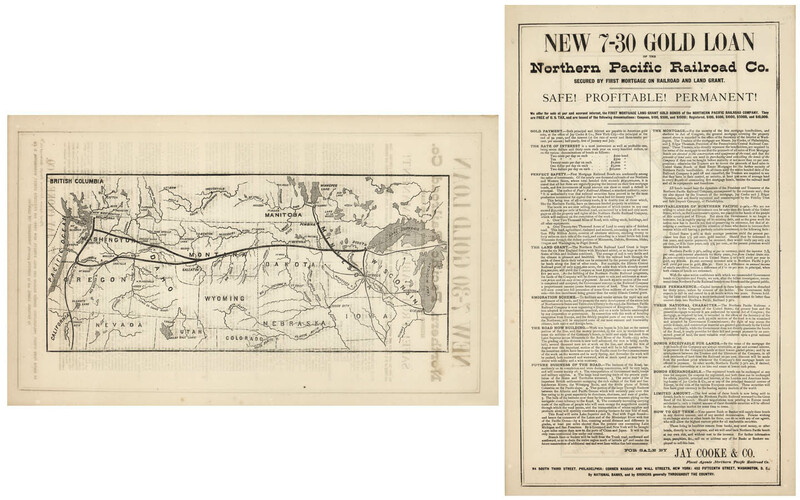 Publisher : Published by Jay Cooke & Co. for the Northern Pacific Railroad Co..	A promotional broadsheet map and advertisement by the Northern Pacific railroad for the sale of bonds to finance the construction of its transcontinental route. The effort to fund the construction of the Transcontinental Railroad commenced in the summer of 1870. By the end of 1871, approximately thirty million dollars in bonds had been sold, which turned out not to be sufficient to fund the construction of the Railroad. 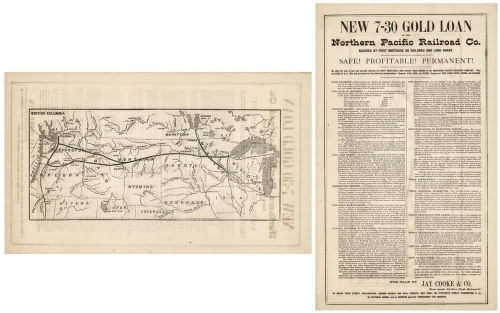 The map extends from Lake Michigan to the Pacific, illustrating the route of the proposed railroad, which was to be the second transcontinental railroad. Though the company was chartered in 1864, construction did not begin until 1870, with the assistance of financier Jay Cooke. The Panic of 1873 would bring a complete halt to the project.